Porsche Cayenne Diesel will be discontinued in the near further in India. The decision is taken by the company seeing the demand of hybrid and petrol variants. Company says this decision will also keep them in line with the future policies to save environment. The steps have already been taken at the production centre of Porsche. The deisel varient is now stopped completely from production. In the past also, Porsche has faced many problem because of its diesel vehicle not meeting the emission norms. 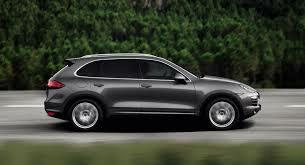 With stopping the production of diesel Cayenne, it will put a complete end to the controversy. If we talk about the numbers, Prosche says that deisel engine has 15% global sales whereas Hybrid has 50% and petrol has 35% of global sales. This compelling figure to gave them a reason to take the decision. The company will now focus more on Hybrid and Petrol models. Diesel cars have to be in compliace with emission norms set by the authority to control air pollution. Porsche will be putting more of Hybrid and Petrol cars in line now. There is one dealership in Mumbai that is still accepting bookings for the diesel model. It is the only dealership in India that is accepting bookings for the diesel model. Porsche may launch its first all electric vehicle in 2019. Electric vehicle are growing in market to save the environment from exhaust pollution.After Porsche has discontinued it diesel production Cayenne, other car brands may also discontinue it. Emission compliance for diesel vehicles is necessary to protect the already damaged environment. Electric and Hybrid cars are the future as they will reduce the vehicular emission and will help create and healthy evironment.